Available to collectors in August, the ABT version of Sylvia is gorgeous and eye-catching. The costuming is painstakingly spot-on. A close-up view of the bodice of the Sylvia doll shows the exquisite detailing and meticulous craftsmanship that is an Alexander Doll Company hallmark. The fiery nature of a performer’s life is showcased in the Nutcracker Spanish Dancer from Alexander. The doll is a mere 10-inches high, but is larger than life in its opulence. Limited to 250 pieces, the Firebird is a radiant part of the ABT’s dance history. The always popular Wendy, 8 inches, is joined by her ballet buddy, the equally well-liked Angelina Ballerina, 6 inches. The Angelina Ballerina series of books and TV shows teach children that hard work is needed to pursue one’s dreams. 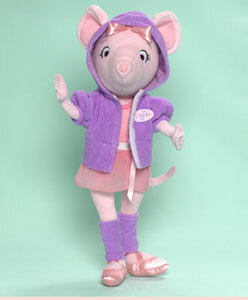 The Born to Dance outfit shows that the mouse has to spend hours in the dance studio. 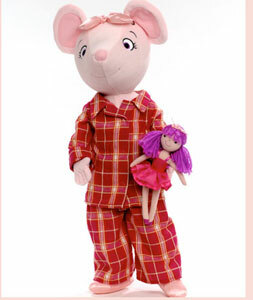 Attired in her performing garb, the 18-inch cloth version of Angelina Ballerina deserves a standing ovation. Alexander strikes just the right chord of sweetness and whimsy with Angelina’s nighttime sleepwear. The pajamas are just perfect, and the tiny ballerina doll is such a funny and cute prop. When I was a very young girl, I loved the ballet. My family, which was not very big on the notion of formal extracurricular activities, knew that I loved to dance, but they didn’t mentor that drive. I vividly remember showing off my self-invented twirls and “en pointe” pirouettes in my home’s garage. Warning to all kids at home: don’t attempt several quick, tiptoed spins on a concrete-slab surface! I lost my balance, was dizzy from the twirling, and fell face-first onto the garage floor. I was bruised and battered, and I knew in my eight-year-old soul that this wouldn’t have happened if I had had a barre to hold on to. About seven years later, when I was a teen, I became aware of the American Ballet Theater, which had a long season at Lincoln Center. With my babysitting money, I bought a token for the subway and a ticket for myself. I was in heaven! Soon my ABT visits were shared by my sister, my mother, and various friends. It was incredible to sit in the partial-view boxes of the theater and see the majesty of the world’s greatest troupe of dancers and their invited guests. And, yes, the view was partial, but that only meant an extreme-right or extreme-left staging was not clearly seen. So, I have a soft spot for the ballet and ballerinas. I enrolled my daughter in classes when she was a toddler, but it wasn’t a good mesh. She’d rather be tumbling and kicking—showing an early flair for MMA (mixed martial arts) than the ABT. My nephew’s little daughter shows the promise of a future prima ballerina. She’s always up on her toes and pirouetting around the family’s living room, and she’s just been enrolled in dance class. As a three-year-old, she’s slightly awkward, but she actually has a lot of dramatic flair. Apparently, the troupe of women who either wish they could have been part of a corps de ballet or actually did enjoy some heady moments in the spotlight must be quite large. When you look at the number of ballet dolls that are available, it is impressive. 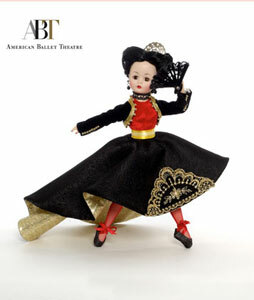 Among the most desirable ballerina interpretations are the creations from Madame Alexander (http://www.madamealexander.com/category/341811/COLLECTIBLE.) And amid their tulle-tutu, silk-bodiced dancers are the very lovely American Ballet Theater replicas and the graceful rodent Angelina Ballerina—which proves that lithe limbs and agile actions aren’t confined to the human species! 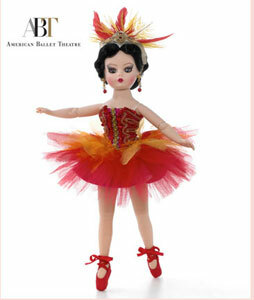 The passion, the power, and the pageantry of the ballet pulsates through their ABT line of dolls. The heroines of the classic tales are meticulously manufactured, and their costumes are true works of art. 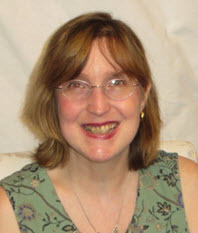 For 2013, the character of Sylvia from the ballet “Sylvia” is joining their lyrical lineup. Limited to 300 pieces, the 10-inch Cissette doll is fully articulated and fully articulate in expressing the majesty of movement. I saw a sample of her at Toy Fair, and she is breathtaking. She’ll be available to own in August, but Alexander is taking pre-orders now. She’s a wonder to behold. 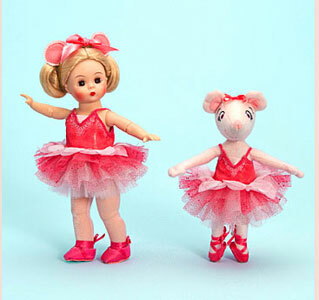 Not as comely, of course, but just as well-executed are the Angelina Ballerina dolls from Alexander. 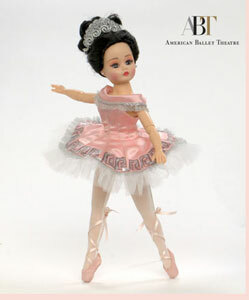 The aspiring dancer doll, which is the most popular licensed product in Alexander’s arsenal, is based upon the children’s-book favorite written by Katharine Holabird and illustrated by Helen Craig. The mouse’s antics unwind in a provincial British town known as Chipping Cheddar. The tiny heroine dreams of a career in the spotlight, and she is tutored by the formidable and talented Miss Lilly. Interestingly, the book series, which numbers close to two dozen, also has wide popularity as an animated TV show. In the cartoon, which airs on PBS, the voice of Angelina is provided by English actress Finty Williams; her dance mistress’s dialogue is spoken by the venerable screen and stage veteran, Dame Judi Dench (who is Williams’s real-life mum). There’s a lot of pedigree and pageantry in the presentation that takes place in a fictional version of Merry Olde England. 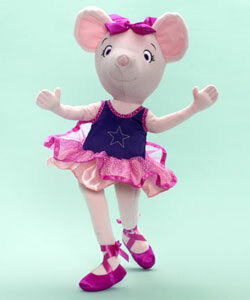 The dreamy mouse character, who yearns to be a successful star in the dance world, has legions of fans among picture book readers, TV viewers, and little kids everywhere who are practicing their pliés and jetés. I am certain that my great-niece (yikes, when did I get so old) is an admirer of Angelina Ballerina. As a beginning ballerina herself, little Madeline is up to the challenge and up on her toes. Alexander wisely offers the beloved mouse heroine in her various dancing costumes as well as in her off-hours outfits: practice clothes and bedtime get-up, too! It’s heartwarming to know that all aspects of the ballet world are focused upon by the talented design team and artists at Alexander. They make the translation of Angelina and the ABT dancers as easy as A, B, C! PreviousReturn to Oz: More wizardly and magical Wizard of Oz dolls crop up along the collectible brick road. NextSpring Awakening: Bunnies, baskets, babies, and divinely inspired dolls—including the pope—define Easter. 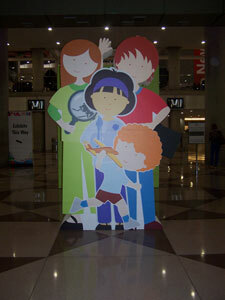 Toy Fair 2012: My fair ladies, lambs, long lines, and laughter.